Joseph Mallozzi's Weblog: June 10, 2012: Misery! Comic Con! Days of Stargate Past – Atlantis! Poisoning the Well and Underground! June 10, 2012: Misery! Comic Con! Days of Stargate Past – Atlantis! Poisoning the Well and Underground! You! You dirty bird. You killed Atlantis Misery! Last night, Akemi and I watched Misery. It was her first time, my…what is it now…twelfth? It’s my favorite Stephen King movie and last night’s screening further cemented it as one of my top ten favorite films of all time. Brilliant performances, a tightly plotted script, and some of the most excruciatingly suspenseful sequences ever committed to celluloid. Nowadays, most horror movies are simply excuses for extended visceral sequences that, after awhile, border on the cartoonish in order to satiate the appetite of an increasingly jaded audience. Misery, in comparison, makes masterful use of the “the build”, crafting unnerving, edge-of-your seat sequences that build in intensity, leaving the audience wondering what…when…where? And when the answer comes, it’s horrific and, best of all, unexpected. 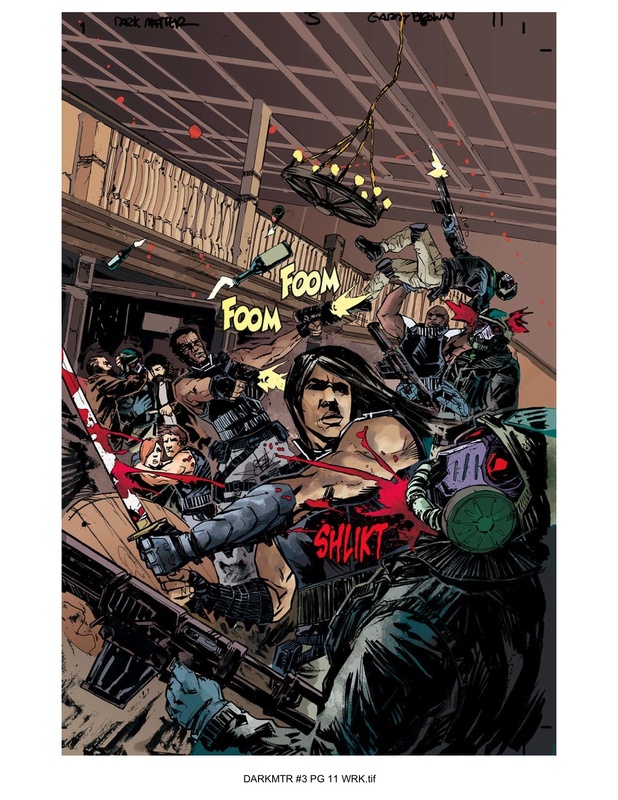 The race back to the room from the kitchen search, the vengeance denied by the hallway hesitation, the startled late night awakening to the looming beside visitor, the frustration of the spilled wine, the shocking shotgun blast, and the hobbling. Oh, the hobbling. We only really catch a glimpse of it, a fraction of a second when Annie swings her hammer and connects, but it’s damn effective. And I would argue that seeing her heft up the hammer and swing for the other foot, even though we don’t see it connect this time, is even more disturbing. The sequence is so unsettling that it has remained with me after so many other far gorier moments in horror filmdom have faded. Just a perfect movie. This is just some of the action you’ll miss if you don’t come seem me at Comic Con. Thanks to everyone who has weighed in with their concerns regarding my planned trip to Comic Con. Fear not, I won’t be sleeping on the streets of San Diego. Dark Horse Comic’s New Events and Community Manager, the super-lovely Kari Yadro, has assured me she’ll be able to swing my accommodations. Whether it’s staying at the hotel that Dark Horse has already booked or napping in Kari’s winnebago while she’s working, I think I’m covered. This was my favorite episode since the two-hour opener. It offered a difficult moral and ethical dilemma with no easy answers and a wonderful emotional arc in Carson Beckett’s working relationship with Perna, the Hoffan scientist. I like my endings like I like my chocolate, bittersweet, so the conclusion to this one really resonated with me. The episode also delivers one of the most unwieldy, difficult to deliver lines in Stargate history with “One hundred percent cellular penetration in all five test inoculations”! Try saying that five times fast. The captive wraith gets a name, Steve, only to die before we get a chance to know him. C’est la vie. Given the circumstances and his push to experiment on the prisoner, I found Sheppard’s “We’re gonna help you” assurance as Steve succumbs to the effects of the Hoffan drug altogether bizarre. If anyone would have adopted this conciliatory stance, it should have been civilian Commander Weir and yet even she sees the logic in Sheppard’s arguments, acceding to his demands for experimentation. When he first mentions it, she brings up the Geneva Convention to which Sheppard counters that if the wraith were at the Geneva Convention, they would have no doubt fed on the other participants. Good point. Ultimately, this enemy is not one that can be reasoned with. Short of discovering a way for them to gain sustenance without feeding on humans (and we’ll come to that later in the series’ run), it’s kill or be killed. There are, of course, those pro-wraithers who point out that the wraith’s actions are dictated by survival instincts. They’re not evil. And, while that may seem true (although the obvious joy they take in torturing their prey suggests otherwise), I would point out that the Atlantis expedition and the rest of the humans in the Pegasus galaxy are simply fighting back, the result of their own survival instincts. Cookie Monster would like to remind everyone that our Supermovie of the Week Club reconvenes tomorrow. Monster will be offering up his thoughts on Batman Forever, so make sure you watch it so that you can provide an informed opinion on his review. Today’s entry is dedicated to blog regular Debra. Previous Article June 9, 2012: Dark Matter! Comic Con! Days of Stargate Past – Stargate: Atlantis! Suspicion and Childhood’s End! Next Article June 11, 2012: The Supermovie of the Week Club reconvenes! Cookie Monster reviews Batman Forever! I LOVE Misery! Er, I mean the movie, of course. I agree – I think it’s one of the best movies ever. Practically note perfect. Just got back from my fly-fishing weekend in Maine, which was great! Lots to catch up on with your blog, though. I’m really enjoying the Atlantis retrospective. @Debra – my thoughts are with you. Hope you’re getting along okay. Misery is one of my favorite books-because Stephen King proves he KNOWS a reader from a casual fan. He writes, if I remember correctly, about the Gottas. You have to get up early but because you’re a Reader, you Gotta know what happens next. You know you’re going to pay for it tomorrow & you know you can pick up the book again in the morning but you Gotta keep reading. Readers don’t just Have to read; there’s just no way on earth we can ever Not read. I’m convinced Readers are like those with a sense of humor. You either Get it or you don’t. Can’t be taught. There are plenty of people who enjoy casual reading but a Reader will read the ingredients on a cereal box, pulling it out of the grocery sack. At a stoplight. Under a streetlight. Because that’s the only light. And THAT’S the relationship between the Author and his Greatest Fan! I loved Misery too. But the hobbling was my least favorite part. Unimaginable pain, I just can’t take it. So mean. Kathy Bates was awesome. I’ve been a fan of hers for quite some time. The dialogue in the movie was great. Now aren’t you glad someone left your gate unlocked and your door open? You got to experience creeping around hallways yourself. Personally I think the Wraiths lack of caring about life other than their own is much like how humans kill other animals for food, be it cows, chickens, pigs and other assorted species. Because we simply see ourselves as the species at the top of the food chain. You could see the Wraith as just the self proclaimed alpha species of the Galaxy, they don’t care about other life as it doesn’t matter to their own, they simply see the inhabitants of the Pegasus Galaxy as nothing but food, lowly lifeforms that aren’t worth their time. The Wraith however, despite the fact they destroy other worlds for their own personal gains are nothing but evil. Wow. Days is on a roll. Though almost totally wrong. First off, the Wraith, reacting to the activation of the amulet, initiated hostilities. But for that, the expedition would have had time to get the lay of the land and avoid setting off the chain of destruction. Second, it was the Wraith who activated all the hives, probably, as Mr. m. Suggested, because of the intel on new feeding grounds. Third, the Hoffan drug was not a bad idea(except to the Wraith) the problem there were the Hoffans, who ignored warnings and insisted on rushing the drug. Head they listened, the Hoffans might well have developed a safer version, without alerting the Wraith until a safe drug could be distributed galaxy wide. The only fault was in abandoning the research, in my mind. That set up the situation for Michael to get hold of it. Dittos the Asurans.with nothing in the database to warn them the conflict was inevitable. Michael is the one thing they were truly guilty of, and their treatment of him was unforgivable. But he elected to take the path he did, and as a sentient being has to live and die by his choices.The expedition did help trigger a war, but without them the Pegasus humans were doomed anyways. For how much lonGer would the Wraith continue to resort to a starvation diet before doing what happened anyways? So sorry, cute they may be, even honorable in some cases, but so long as they viewed humans as animals and food, things could go no other way. Underground was a great episode, though I’m biased. I love Colman Meaney as a actor, and was thrilled to see him on Atlantis. And later appearances by the Genii did not disappoint. Wow, didn’t realize how much I missed talking about At,antis. Thanks for providing the opportunity and venue to do so. Bravo das… I’m impressed, you do know your SGA story lines. But, wasn’t there a scene with Beckett agonizing about the ethics of what he was doing to Michael? @Joe: What das said. Agree 100%. Very eloquent in explaining our sympathy for the Wraith is our das. Too tired to type much – rode my bike 39 miles today in a benefit for the American Diabetes Association. I raised $500 for the cause. G’night. Hey Joe! I must crumble and admit that I read your blog frequently, but never post! I’d plead anonymity on the Internet but that would just be fibbing. Thanks for the detailed commentary on Misery! You’ve piqued my interest, given the repetitive and mundane products often coming out of Hollywood! I’ve gotta get my hand on it!! Sending prayers you’re way and hoping for the best. I have seen some incredible recoveries with strokes including a friend of mine who lost some minor memories but otherwise made a pretty full recovery. Still every case is different, so we’re praying for you all. I haven’t taken in this film since I’m not generally interested in horror, but I may have to try it just this once. I’ve enjoyed some other works of King’s such as Cujo, and Christine, but “crazy” has never really been a draw for me (it’s for that reason I’ve avoided the “Friday the 13th” and Hannibal Lector type films). BTW, how did Akemi like Misery? As much as I loved Todd and the Wraith as characters, the Wraith as a species brought untold horror to and terrorized the human population of Pegasus long before our guys showed up. If they couldn’t find a way to survive without torturing and killing fellow sentient beings (us), they gave up any ethical highground and deserved to be eliminated as a threat in some fashion, however that could be achieved. I felt for the Hoffans, and perhaps would have voted the same way they did. I loved the Genii as villains, I wish Kolya would have stuck around as a thorn in the expedition’s (and Sheppard’s) side for much longer than he did. I think I’ve said this before, while reading Misery I had to actually stop reading for a few days when I got to the hobbling scene. I put the book down in mid sentence and just had to walk away. It’s the first and only time I’ve ever had to do that. So, naturally, when I went to see the movie I was waiting with trepidation to see the scene played out in front of me. While the scene in the movie is horrific it didn’t affect me the same way. Mostly, I think, was because in the movie Kathy Bates uses a hammer while in the book her character uses an axe! Much more horrific! So glad to hear you won’t be on the streets of San Diego, Joe. I hear they’re pretty crowded in July. I liked the introduction of the Genii. They proved to be formidable through the series. @ Sparrowhawk – I can always rely on you having my back when it comes to all things Wraith. I no longer argue with the naysayers over the difference between choice and instinct, or the difference between evil intent and biological need. Either you get it, or you don’t. But I will speak up when the Wraith are being unjustly maligned. It reminds me of how people started hating sharks after Jaws came out, considering them evil, calculating eating machines. Between those bastards killing sharks for their fins, and knuckleheads thinking they’re doing the world a favor by killing sharks for sport, several species of these magnificent creatures may soon face extinction. Thing is, I love me a good shark steak – it’s one of the few fish I actually enjoy eating. But I will gladly give it up if shark numbers continue to decline (I only have shark maybe once a year, so it’s not like it would be a huge sacrifice, but more of a ecological statement). Keep in mind that I have my own fears about going in the water and becoming shark food, but instead of thinking it’s my duty to protect the world by killing them first, I just avoid taking unnecessary risks when enjoying a day at the beach. And congrats on your ride! Yesterday while you were peddling your little heart out, I was taking a nap. Das: Had Sheppard and his Mystery Puddle Jumper full of meddlers kept their fingers out of things, it’s very possible that the Wraith would have naturally thinned their own numbers through in-fighting, That was just priceless! One of my friend’s was telling me about her carpal tunnel surgery. I didn’t get into specifics with her but she did say something troubling. She said that you had to have the surgery before nerve damage set in. I’m sure your dr has discussed it you but …..
Mr. M: Some of you have suggested signed photos of my dogs but, to be honest, it’s hard enough getting them outside to do their business. Signing stuff would be almost impossible. I’m loving the SGA memories and it does bring up some ethical questions. I would say that the Wraith aren’t a product of natural evolution and should be considered targets (sorry Das). Do you have any good remembrances of the actors you can share? Is Akemi going with you to comic con? Did you find a dog sitter? Debra: I’ll join the others and pray for your sister. Do you live near her? I can’t do horror films. I’m waaay too chicken and get nightmares. I have an overactive imagination, and I won’t be able to sleep for weeks. Not my thing. Poisoning the Well was a great episode. It had such depth and meaning. I love that it went as dark as it did. It was kind of refreshing to see such deep and richness in a story. I love Carson Beckett in this one. Thanks to everyone for the good wishes and for the dedication. I have to admit I WANT to watch Misery but have only managed in small segments. Stressful movies well, stress me. I agree on the Wraiths. I am sorry, but SG1 got stupid Ori and Atlantis got the coolest foes ever! I just found the story utterly believable because faced with that level of threat, there would be plenty more than willing to send in test subjects. Hell, there would be some ready to volunteer. I am a Jew. And when I hear people put down Germans who did “nothing” I am quick to say they have NO IDEA. No one knows how brave or stupid you would be in such a situation where you could almost decidedly do very little or nothing, and almost certainly bring death to yourself and your entire family. Those that did stand up were marvels and miracles, but it doesn’t make those who did nothing into monsters. Faced with being Wraith food, I might well choose the vaccine too. Misery is very watchable, but as usual, I prefer the book. Ah, the book. 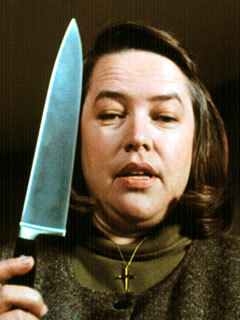 Kathy Bates does an incredible Annie Wilkes, but the Annie in the book is far, far scarier. Who needs more than one thumb anyway? @ 2cats – I know my SGA storylines when they involve the Wraith. As far as Beckett is concerned, yeah, I believe early on he had reservations about the experiment on Michael, but then after he created his little Frankenstein monster, he – and everyone – seemed to blame Michael for what he had become instead of blaming themselves for creating him. @ Tam Dixon – Yeah, I know about the nerve damage thing. I’ve only been to the doctor once for this a couple years ago, so not sure what they’d tell me now. Procrastination will be the death of me, I just know it.